Orders are now being taken for a December 31, 2019 pickup date. Distribution will be from Ongoing - Appointment Only at Lakewood, CA. 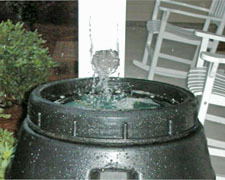 Only rain barrels ordered in advance on the form below are guaranteed to be available. Special Event* December 31, 2019 - Rain Barrels Intl.